Miami Beach is one of the most beautiful and exciting places to live in the country. What most people don’t realize is that there’s a lot more to this unique city than sunshine and bikinis. 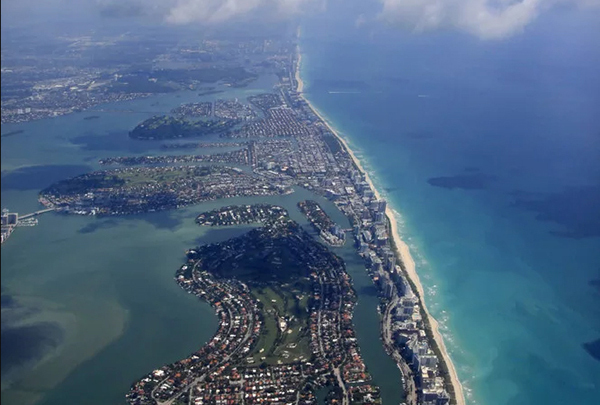 Here are some cool facts about Miami Beach that just might surprise you. Many celebrities visit Miami Beach every day. This may be because it’s not only just a few miles from South Beach, but it is a little less than two hours from the luxurious city of Palm Beach. There are more than 800 buildings that feature Art Deco Architecture in Miami Beach. This makes it the largest collection of this type of architecture in the entire world. The historic districts of Espanola Way, Collins/Washington Avenues, Flamingo Park and Museum make up the National Register Art Deco District. Miami Beach is surrounded by both the Biscayne National Park and the Everglades National Park. It’s the only city in the United States that has two different national parks as part of its borders. Both parks offer a wide array of activities for visitors to partake in including wildlife watching and canoeing. For those that want to take a cruise, Miami Beach is the place to be. Miami contains the largest cruise ship port in the entire world. Many cruise ships go in and out of this port on a daily basis. You can see them all come in and out from Miami Beach’s beautiful South Pointe Park. Miami Beach is one of the few man-made islands in the United States. It was once a desolate coconut grove plantation. Years back, most people would have never guessed that it would become what it is today. Miami Beach is a very diverse place. It is estimated that there are at least 150 ethnicities as well as over 60 different languages spoken there. When visiting Miami Beach it doesn’t matter where you are from or what language you speak, you will probably find someone who speaks the same language as you. There are many different cultural venues to visit in the area as well. If you walk down Lincoln Road, Ocean Drive or Collins Avenue and close your eyes you will hear many different languages. You literally feel like your are standing in the lobby of the United Nations building in New York. Miami Beach has a cosmopolitan side too it. There are many restaurants that are rated world class as well as booming modeling and recording industries. The inventor of suntan lotion was from Miami Beach. He was a pharmacist named Benjamin Green and came up with the useful concoction in 1944. Now visitors of Miami Beach can safely protect themselves from the sun thanks to Benjamin Green’s invention. If you happen to be in the art deco district in Miami Beach, cool off at the Wolfsonian Museum at 10th and Washington Ave. Even better than the cold AC is the free admission every Friday after 6 pm. The Wolfsonian – FIU museum, library, and research center features rotating exhibitions of internationally renowned artists and historical artifacts, depending on the season. The space is an art lover’s delight, but the Wolfsonian’s strong suit is the building itself. Founded in 1996, the Mediterranean revival building was formerly the Washington Storage Company in the 1920’s and still has its original, well-preserved exterior and vintage elevator. With its peacock feather sculpture and detailing over a fountain, it’s an elevator ride that will transport you to the 1920’s. For history buffs and vintage design aficionados, Art Deco Weekend is a little slice of heaven on Ocean Drive. Every January, step back in time and take in the live swing music and large tents filled with well-preserved furniture and knickknacks from the 20s and 30s. Thanks to the Miami Design Preservation League, the event has been a Miami tradition for decades. After perusing art deco treasures from back in the day, head down the strip between 13th St and 5th and immerse yourself in the heart of the action. Keep walking and you’ll find lots of food trucks selling comfort food from around the world, plus local artists and designers selling accessories, clothing, and unique artwork. For the interior designer with discerning taste, the Art Deco Weekend is a chance to update your space with some classic pieces. A Miami Beach trip isn’t complete until you’ve tried fresh coconut juice right off the tree. If you walk along the Beachwalk (aka The Boardwalk), an oceanfront foot and bike path starting at Niki Beach in South Point, you will find locals selling coconuts from shopping carts for a dollar or two. The path goes all the way to 23rd Street where it turns into a foot only path on a wooden boardwalk. Sunset is the perfect time to meander along for people-watching, an after work run, or a pre-dinner stroll. Take the path all the way to South Pointe Park and watch the cruise ships embarking from Port Miami to the new pier. Along the way, stop off in Lummus Park to take in Ocean Drive and its iconic Art Deco hotels. For a day in paradise, the Beachwalk (aka The Boardwalk) is a great place to start. For the cheapest date in Miami Beach, head to the New World Symphony park on Washington Ave near Lincoln Rd, the popular shopping district in South Beach. Starting in each October, Citibank hosts its free Soundscape Cinema series featuring new releases and classic movies on the symphony’s 7,000 square foot projection wall. Sit back in a comfy lawn chair, cozy up with friends on a blanket, and break open that bottle of vintage red to enjoy a movie under the nighttime stars. For a schedule of upcoming movies, visit http://www.mbculture.com/scroll.aspx?id=81 for updates. After a day of shopping or sunbathing, enjoy a break from the asphalt jungle and hustle of the city at the Miami Beach Botanical Garden in South Beach. Across the street from the Convention Center at 2000 Convention Center Drive, the 2.6-acre green space was designed by landscape architect Raymond Jungles. Under the shade of palms and flowering trees, explore the edible garden filled with herbs and the many orchid varieties near the fishpond. The garden also features a gazebo in the woods and a small Japanese style garden, a serene place to get centered and hide out from the sweltering Miami sun. All of these attractions and many more make Miami Beach the perfect place to live life to the fullest!